In early 20th century Japan, involvement in martial arts was a competitive and dangerous business. Contests, feuds and rivalries often resulted in injuries and even deaths. 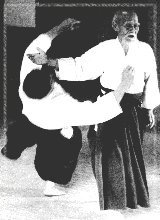 The formulation of Aikido dates from an incident that occurred in 1925. In the course of a discussion about martial arts, a disagreement arose between O-Sensei and a naval officer who was a fencing instructor. The officer challenged O-Sensei to a match, and attacked with a wooden sword. O-Sensei faced the officer unarmed, and won the match by evading blows until his attacker dropped from exhaustion. He later recalled that he could see his opponent's moves before they were executed, and that this was the beginning of his enlightenment. He had defeated an armed attacker without hurting him - without even touching him. 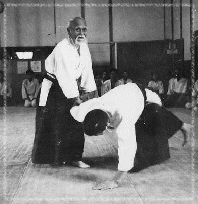 O-Sensei continued to practice and teach Aikido into his old age. Observers would marvel at his martial abilites, vitality, and good humor; he was still giving public demonstrations of Aikido at age 86, four months before his death. After he passed away on April 26th, 1969, the Japanese government posthumously declared Morihei Ueshiba a Sacred National Treasure of Japan. 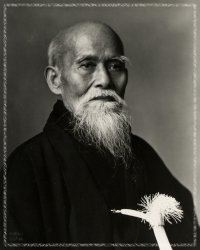 O-Sensei's son, Kisshomaru Ueshiba, then inherited the title of Doshu or 'Leader of the Way', becoming the second person to hold the title. For many years, the second Doshu regularly taught and practised Aikido at Aikido World Headquarters, called Hombu Dojo in Tokyo, overseeing the eventual spread of Aikido around the world, through the many demonstrations and seminars that he led across the globe. Kisshomaru Ueshiba passed away on January 4th, 1999, and his son Moriteru Ueshiba, O-Sensei's grandson, became the third Doshu. He continues the work of his father and grandfather. Today, the art of Aikido is practiced by men, women and children, of all ages, in over fifty countries. O-Sensei's teachings continue to enlighten the lives of thousands of people all over the world.